Reprinted here from our February 2016 online newsletter. Saturday morning, standing on our home planet, I gazed into the clear early dawn darkness to catch the glow of five planets revolving in outer space. As a shimmering moon bedded down at the horizon, I tingled with wonder at the radiance that held so much power. I knew that our lights glimmered back to theirs. Earth’s cities beckon into the far reaches of space. With this February e-news I celebrate with you LAUDATO SI: PRAISE BE TO YOU. 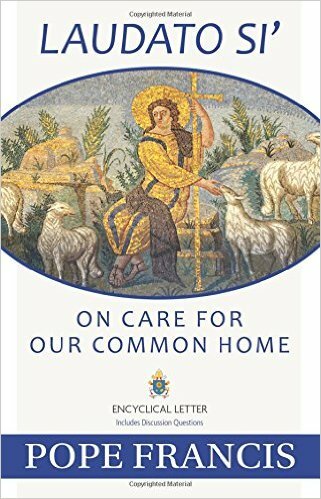 Pope Francis has written this amazing letter to all of us ON THE CARE FOR OUR COMMON HOME. At the Christine Center, we urge you to read it and take it to heart. Many of you are well aware and have shifted over the years to be aligned with this urgent message. Be affirmed and supported in your efforts. Be steadfast as you deepen in wisdom and respond as a planetary citizen. So important is the work for spiritual deepening and global transformation that Pope Francis takes Chapter Six to talk about ecological spirituality. I read the focus on “… awareness of our common origin, of our mutual belonging and of a future to be shared with everyone” as an affirmation of our Christine Center Prayer of Unity prayed each day at the end of the morning meditation. In the prayer we affirm we are one in mind, heart and body. That’s unity consciousness! Programs at the Christine Center are designed to deepen and strengthen one’s potential to care for our common home. The woods, meadows and gardens offer themselves for our contemplation and delight. We may be moved to a deepening respect, full of gratitude for the silent giving of plants and animals which sustains us. We, in turn, respond with compassion to others and ourselves. Being here is preparation for serving the common good. Our spiritual practice is deepening for global transformation! PRAISE IS TO YOU! For all the ways you are aware and making a difference for our common home! We invite you to the Stillness.